For decades Avelino and Daisy Reano made some of the finest mosaic inlay work together as a husband and wife team. Over time they raised their family and taught their children to make this fine work. Avelino died in March 2009 and Daisy continues to make this fine work on her own. This oval pendant is inlaid on a white clam shell foundation. While beautifully polished and perfectly formed, it exudes the essence of the finest handmade work. The tiles are made from Kingman turquoise, orange spiny oyster and mother of pearl and suggest almost machine-like precision, yet telltale aspects of the handmade are not only discernible, but render the work even more attractive. 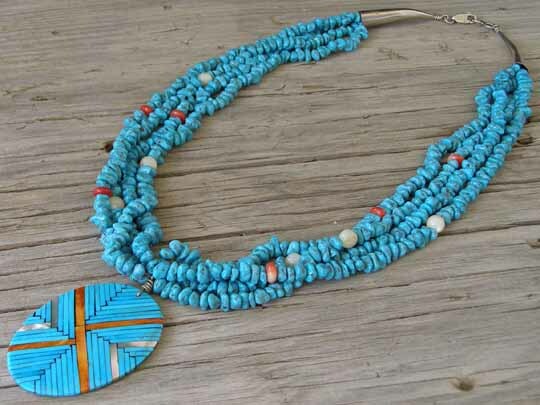 The pendant is attached to a four strand necklace of stacked "baby nuggets" of Kingman turquoise punctuated by round beads of mother of pearl and rolled beads of red spiny oyster. The necklace is finished with curved Sterling cones at the catch. You can see the hands of the maker in this. Dimensions of pendant: 2" x 1 1/2"